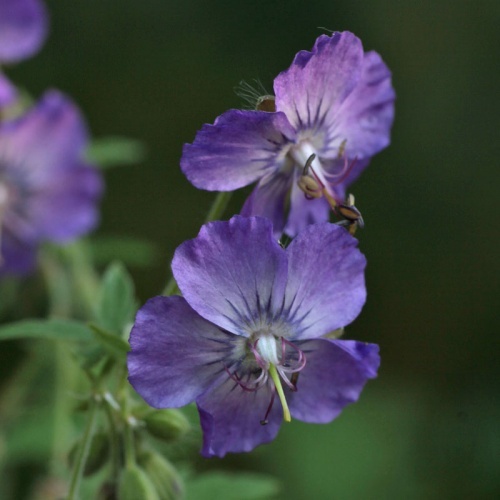 Pretty spring flowering plants for shady places, many with variegated leaves. Clump forming and semi-evergreen they are useful under deciduous trees and shrubs as well as in more open areas, tolerating sun as long as the soil doesn't dry out. 30cm-90cm in flower, most around about 60cm. 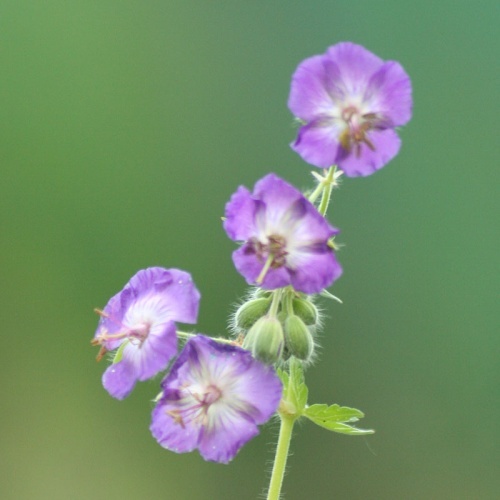 The dusky cranesbill (Geranium phaeum) is a British native, albeit rarely seen so is always a good choice if you need a plant you know will do well. Many of the cultivars grown have originated in continental Europe though, a lot of them wild collected forms from southern central Europe where it is much more commonly seen than in the UK. 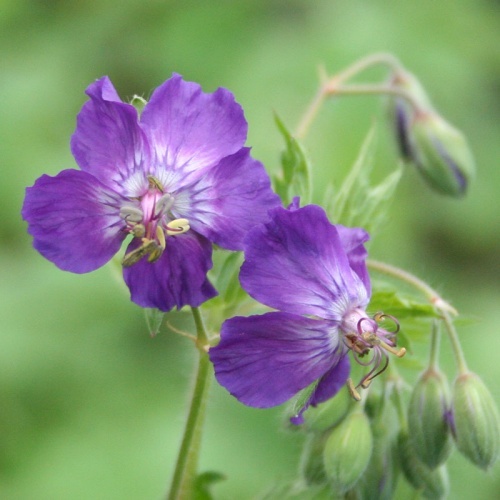 Geranium phaeum, Geranium reflexum and their hybrid Geranium x monacense typically grow in deciduous woodland and hedgerows, often in more open areas and clearings. While most varieties have been selected and named for the varied flower colours (white, pinks and purples), patterns and heights there are also a large number of cultivars that have been named for their coloured, variegated or patterned leaves. 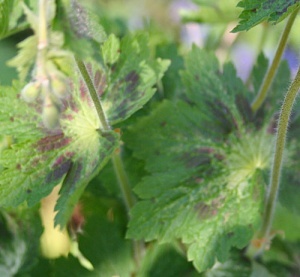 Some, like 'Samobor' have brown markings reminiscent of Pelargoniums, others have white, cream or yellow on green leaves with some starting the year yellow or cream and turning green as they age. 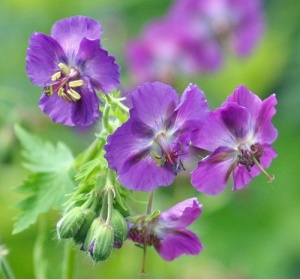 Many people dislike Geranium phaeum as it does tend to self-seed a bit but if you have a semi wild area of shrubs or trees this habit is actually really useful and from a few well chosen cultivars you can have a superb natural hybrid swarm in a few years time. 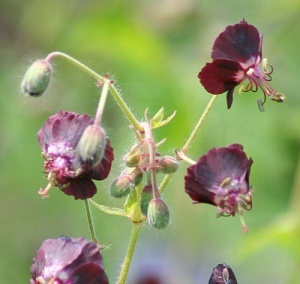 In more formal, well-gardened areas, it really isn't much trouble to keep the seedlings weeded out and there certainly won't be carpets of them in most gardens. A recent variety from Sarastro Nursery in Austria, collected in Croatia. Unusual deepest red flowers with swept back petals. 50cm. A relatively recent introduction with soft pink flowers, near white towards the centres and light green foliage. For average soil in shade. 60cm. Yellow spring leaves turn green later. Deep pink flowers. 50cm. 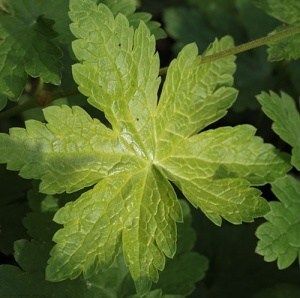 Prefers shade but will grow in the open if moist enough and respond well if humusy material is incorporated into the soil. A recent form with 'Samobor'-like brown markings with the centre of each leaf strongly flushed with pale yellow in spring. 60cm. A rarely seen cultivar from Jan Spruyt with rich purple flowers with near-white centres over plain green foliage. Shade or part shade, average soil. Flowers late spring to early summer. 70cm. New introduction for 2012 from our own breeding. 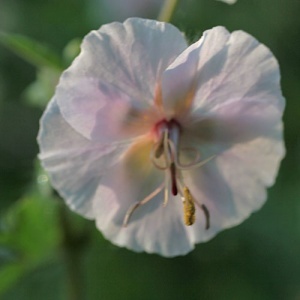 Compact plants with white flowers, with the slightest pink tinge as they age, from dark calyces. The foliage has ghostly 'Samobor' type markings (one of it's parents). Shade, ordinary to good soil. 45cm. A lovely French selection with faded reddish pink flowers hovering over a clump of yellow-green leaves with reddish brown spots. Foliage at it's best in late winter. Shade, reasonable soil. 50cm.